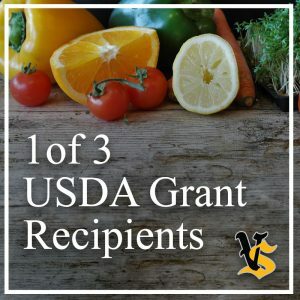 We plan to expand the amount of locally sourced foods we use, provide training for food service staff and create menu options that include more scratch cooking,” was how VS school superintendent Mary Jo Hainstock reacted to the news of a $48,000 grant from the USDA to encourage the use of nutritious, locally grown food. She also said that Carolyn Frazier, the chair of the VS Farm-to-School group deserved a great deal of credit for the school’s successful application to the USDA. The Vinton-Shellsburg Community School District was one of just three school districts to receive an award, and only four grants were awarded in the state of Iowa. The specific uses of the grant as detailed in the award announcement said: The Vinton-Shellsburg Schools will partner with the local Farm-to-School Chapter to address childhood obesity, food insecurity, and nutrition concerns by integrating more locally produced, fresh ingredients in the school meal program. The Farm-to-School Chapter offers food samples, education, and training to students and staff. Vinton-Shellsburg Schools will develop a comprehensive plan to build the capacity of staff, students, and families and identify local farmers who can provide fresh produce. The plan will include training and mentorship opportunities for nutrition staff to learn about scratch-cooking techniques, recipe development, and menu design.